Three-axis attitude determination, which is equivalent to the complete specification of the attitude matrix. A, is accomplished either by an extension of the geometric techniques described in Chapter 11 or by a direct application of the concept of attitude as a rotation matrix. If the spacecraft has a preferred axis, such as the angular momentum vector of a spinning spacecraft or the boresight of a payload sensor, it is usually convenient to specify three-axis attitude in terms of the attitude of the preferred axis plus a phase angle about that axis. This asymmetric treatment of the attitude angles is usually justified by the attitude sensor configuration and the attitude accuracy requirements, which are generally more severe for the preferred axis. 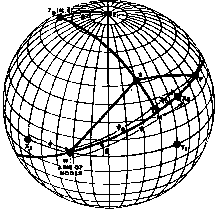 We refer to this method as geometric three-axis attitude determination because the phase angle is computed most conveniently using spherical trigonometry. Alternatively, in the algebraic method, the attitude matrix is determined directly from two vector observations without resorting to any angular representation. Finally, the q method provides a means for computing an optimal three-axis attitude from many vector observations. In this section we describe these methods for the computation of three-axis attitude. The geometric method is normally used when there is a body axis—such as the spin axis of a momentum wheel, a wheel-mounted sensor, or the spacecraft itself, about which there is preferential attitude data. Either deterministic techniques, as described in Chapter 11, or differential correction techniques, as will be described in Chapter 13, may be used to compute the attitude of the preferred axis. The phase angle about the preferred axis is then computed from any measurement which provides an angle about that axis. In many cases, the geometric method is required because the sensor measurements themselves (e.g., spinning Sun sensors or horizon scanners) define a preferred spacecraft axis and provide only poor azimuthal information about that axis. *Note that M-S>0 by the definition of M. If M-S = 0, \f/a is indeterminate because S provides no phase information about ZB. If M-S>0, ifo is obtained unambiguously because the quadran's of both sini/ia and cosi/>0 are known. 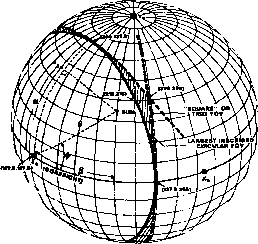 t For the synchronous CTS orbit, the azimuthal difference or clock angle is zero at local midnight and decreases by 15 dep/hnur.